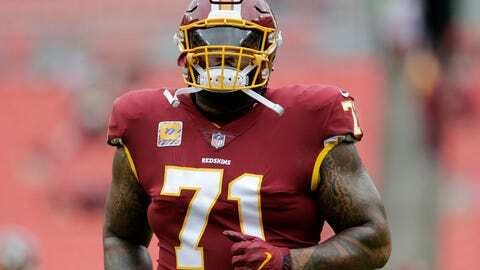 ASHBURN, Va. (AP) — Trent Williams wasn’t worried as he climbed into an ambulance to be evaluated at a Dallas hospital. The Washington Redskins‘ starting left tackle was hit in the chest and felt lightheaded, so the concern was a possible liver injury. Williams checked out just fine and was back at practice Monday. That’s a prudent approach for a team that’s down to its backup quarterback, missing two starting offensive linemen and its top receiver for the rest of the season and could be without a handful of other key players for a big game next Monday night at the defending Super Bowl champion Philadelphia Eagles. Playing with a skeleton crew of starters has become the new normal for the Redskins. A lot of injuries have happened. Quarterback Alex Smith, receiver Paul Richardson and starting guards Brandon Scherff and Shawn Lauvao are out for the season. Thompson hopes to play after missing so many games he can’t count with broken ribs — six, in total — and it would be a major boost if receiver Jamison Crowder can return after missing almost two months with an injured right ankle. The Redskins have lost three of four since starting 5-2 and yet are still tied with Dallas at 6-5 atop the NFC East. Beating Philadelphia on the road Monday night in Colt McCoy ‘s second start at quarterback would go a long way toward winning the mediocre division, especially if the Cowboys lose at New Orleans on Thursday. Thompson has felt noticeable improvement from a fractured rib on each side of his rib cage and is optimistic he’ll be strong enough to play within a week. The situation is a bit murkier for Crowder and cornerback Quinton Dunbar, who were among a host of players who didn’t take part in a bonus day of practice Monday that followed a long weekend off. Because of the extra time before facing the Eagles, coach Jay Gruden and his staff can take a cautious approach with “sore” tight end Jordan Reed; right tackle Morgan Moses, who’s dealing with ankle irritation; and defensive lineman Matt Ioannidis, who was held out with a calf injury. Like last season, when injuries derailed the Redskins’ playoff hopes long before the stretch run, it has been that kind of year with players going down left and right. Thompson is more than ready. The broken ribs have bothered Thompson when trying to sleep or when laughing or coughing, but the pain of watching his teammates lose without him has him eager to get back on the field.